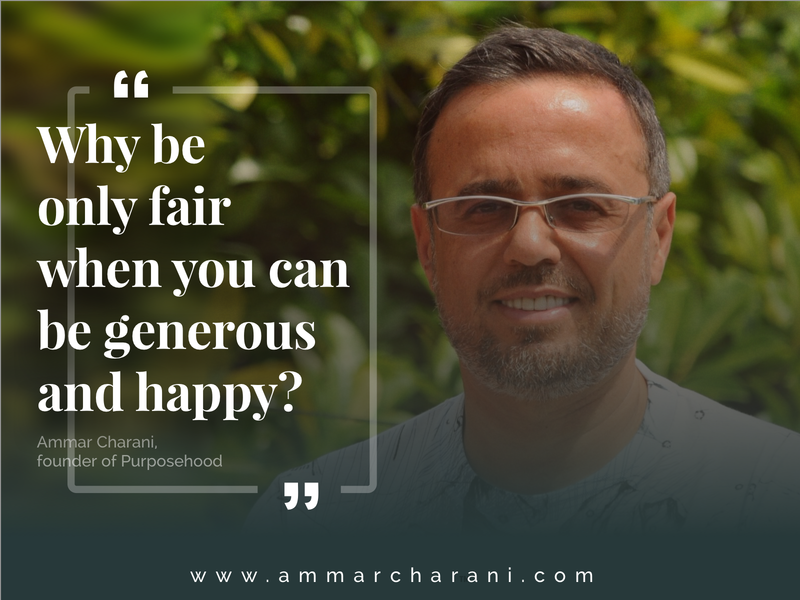 Why be fair when you can be generous? I’m not sure if professor Guhan Subramanian of Harvard Business School who taught me several cases on negotiations would fully approve of this strategy but I can tell you from my experience that I’m much happier with the outcome than I would’ve been otherwise. Recently I was in a tough negotiation with a co-founder of one of our companies. The relationship has gone sour as we couldn’t agree on defining what’s a fair compensation for his contributions. He felt that his contributions were worth much more than the deal that he had. A few months earlier we ended up signing an agreement that each of us felt it was good for the other party but not fair for oneself! He had proposed a new agreement which I deemed not acceptable and we were heading to an impasse. As I was taught at Harvard Business School, I’d prepared my BATNA (Best Alternative to a Negotiated Agreement) and built a position on it. It was a fair position that would have argued the validity of the earlier agreement and offered a bit better terms for him to try to keep him in the company. But it was short of his expectations. I had almost all the cards lined up and his only card would have been quitting. I confess, my heart was tight every time I thought about this coming negotiation. I don’t enjoy conflict and this was for sure heading that way. That thought stuck in my head. You can play by the book but that doesn’t make it fair. You can do what’s acceptable but that doesn’t bring joy. You can have a comfortable life but that doesn’t make you happy. You can be fair but that doesn’t make you generous. My thought was, he’s a good person who really poured his heart into this company. I thought about our future meetings and how unpleasant they would be if he felt he was forced into a deal he felt wasn’t fair for him. I decided it wasn’t worth it. Life is too short to argue over what’s fair. Happiness is with generosity. As we met for our negotiation in NY, he was tense. He started by positioning his argument of what’s fair for him. I wasn’t tense at all. I wanted him to air out his starting position which he strongly suspected he wouldn’t get. Then I laid out my offer. It was far better than his expectations. What was expected to be a tense meeting turned to smiles, hope and renewed energy. He felt great. And I did, too. I was fortunate then and I’m fortunate now. Ammar is an American serial social entrepreneur of Syrian origins with businesses and friendships across the world. He has an Engineering degree from University of Central Florida. He’s also an alumnus of Harvard President’s Program in Leadership. Ammar is a member of multiple YPO chapters in the US, Europe and Middle East. Currently, he’s serving as YPO regional education officer for Europe. Please share with others if you think it’s useful.